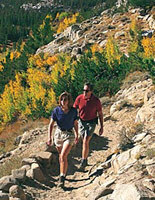 Hiking in Mammoth is an all year experience and certainly not be missed. In the early season, hikes are filled with trees getting their first leaves, the beginning of the waterfalls, and the birds and sounds of nature waking up. In summer, the mountainside is in its full glory with wildflowers, nature and the smell of the forest air. If you want something more aggressive, you might want to go mountaineering or rock climbing. In fall, there is a beautiful season with crisp mountain mornings, warm days and the opportunity to experience the colors that comprise the palette of autumn. Aspen, willow and cottonwood trees light up the slopes during this very special time of year. Fall is definitely photography season, so be sure to bring a camera and plenty of film. There are lots of guidebooks to help you find the right trails and trailheads. Not enough can be said about Yosemite. It is Mammoth's closest big neighbor just 45 minutes north of town. You can do self guided tours and sights to see in Yosemite, and go on some unbelievabley gorgeous hikes in Yosemite. It is a whole day. You'll enter from Highway 120 also known as the Tioga Pass. We used to say... bring a lot of film, but now, make sure your cell phone camera has a lot of digital space, you're going to need it. If you don't know what to bring, print out the List of items to take on vacation checklist. Please camp, hike, fish and enjoy the Sierras without leaving a trace. 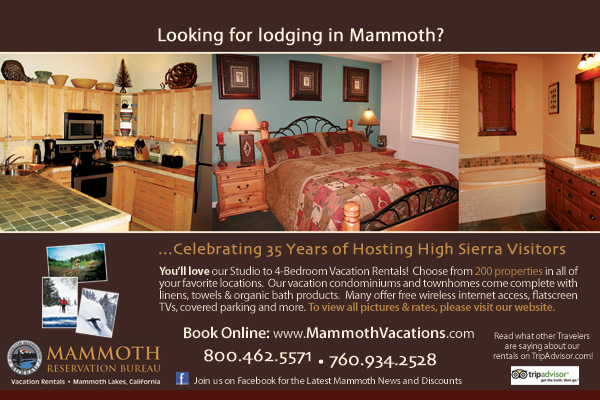 City Concierge provides Mammoth reservations for lodging along with personal service for your vacation in Mammoth Lakes. We have the insider information so your vacation can be a special one.